When ripe, densely flavored fruit is available, take the opportunity to serve it fresh with a few adornments. This peach compote dish should inspire your creativity. With peaches I prefer the late season selections. They have rich flavor, sturdy texture, and usually are freestone. Here in Central California, they are available at every fruit stand and in most backyards. This is a simple way to enjoy their full flavor and their antioxidant goodness. The almond liqueur is optional, but highly recommended. Place the peach slices in individual dessert dishes, the more beautiful, the better. Sprinkle a tablespoon of liquor over each peach portion and allow to sit for a few minutes for the flavors to blend. 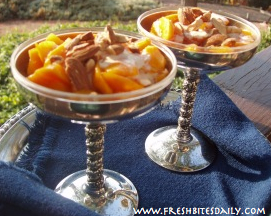 Drizzle the cream over the peaches and sprinkle on the toasted almonds. Eliminate the cream and use the fruit mixtures as a topping on vanilla iced cream. Use other fruit: bananas with brandy, cantaloupe with rum. This fermented plum brandy will change the way you think about your fruit trees! What to do with extra-small pit fruit? Here’s your plan (with a plum recipe)! A Cherry Salsa Recipe To Delight Your Senses! 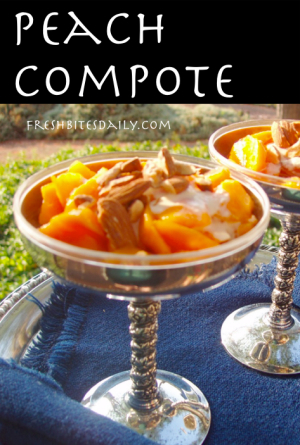 5 Comments on "Peach Compote with Cream and Almonds: Quick and Tasty"
My mouth is watering – and craving peaches and cream now. This recipe sounds so flavorful. I wait all year for peaches to be in season. They’re well worth the wait. Thanks for sharing with Sweets This Week. Yum! My favorite kind of dessert – fruity and creamy! Thank you so much for stopping by and sharing this wonderful peach compote recipe. I loved it so much that I featured it this weekend on Fresh Food Friday / Seasonal Saturday. I hope that you can check it out, grab the button if you like and share a few more recipes before the party ends on Monday. Thanks again and WELCOME! What a great and delicious recipe. !Thank you for sharing your recipe with us! I really enjoyed reading your recipe. 🙂 I will try to cook if I have time. Thanks once again!